When traffic lights were first being installed around the country, it was most common for the signal heads to be mounted on top of poles about 8 feet tall on the corners, or on “islands” in the middle of the street, and/or on the side of utility and streetlamp posts via mounting arms. These methods are still used today (the islands are extremely rare), but usually in an auxiliary way along with signals hanging overhead. In the earliest years, drivers had to keep an eye out at this low level for all the signals – sometimes with only one light per approach. In this section, I will post vintage photos from around the state, mostly culled from the RC Maxwell advertising company’s archive kept online at Duke University. Click these photos to see the full size version. Among the coolest signals I’ve ever seen are these early pedestal-style Horni Signals with small semi-rectangular lenses. The ad on the left and the 1931 photo on the right are both from Asbury Park. Amazingly, a signal of this same type showed up on eBay some years ago. Asbury Park also used similarly old span-wire signals. 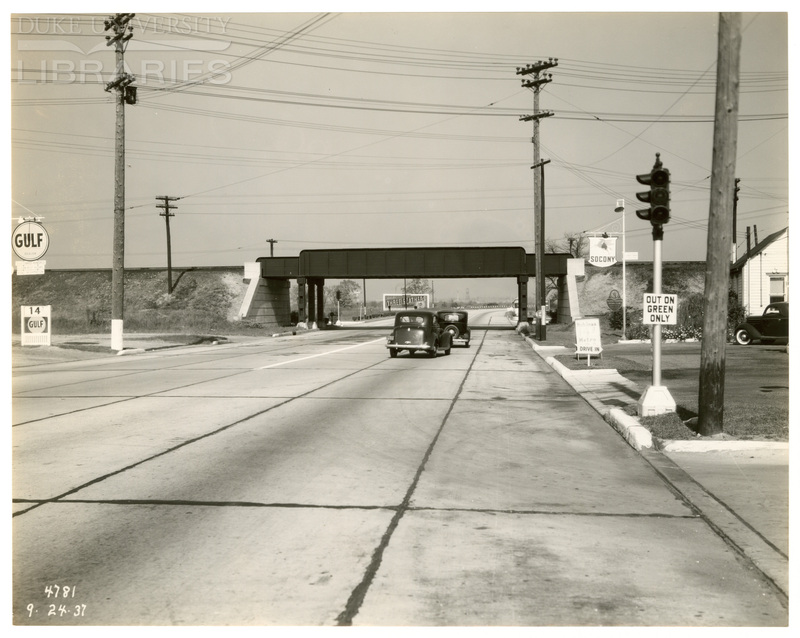 Above we see one fine looking 4-way signal on a fine day in Hawthorne in 1930. I’m not sure I can recognize the make of this one. I’m wondering if it’s a brand that was not seen as often in New Jersey, like Essco. The signals above most certainly are Esscos – photographed somewhere close to the Tacony-Palmyra Bridge in 1937. I have yet to figure out what the OUT ON GREEN ONLY sign means. The photo above is one I put in the “mind-blowing” category. Today, US-1 and Milltown Road in North Brunswick is a multi-lane overpass with ramps. Back in 1937, when US-1 was NJ-25, the corner was controlled by pedestal-mounted signals. I believe those are solid-cast Horni signals facing the photographer and American Gas Accumulator signals facing Milltown Road on the left. Just a few miles up the road in downtown New Brunswick, we find circa 1920s Crouse-Hinds Type T signals with decorative hardware at the corner of George & Albany Streets. 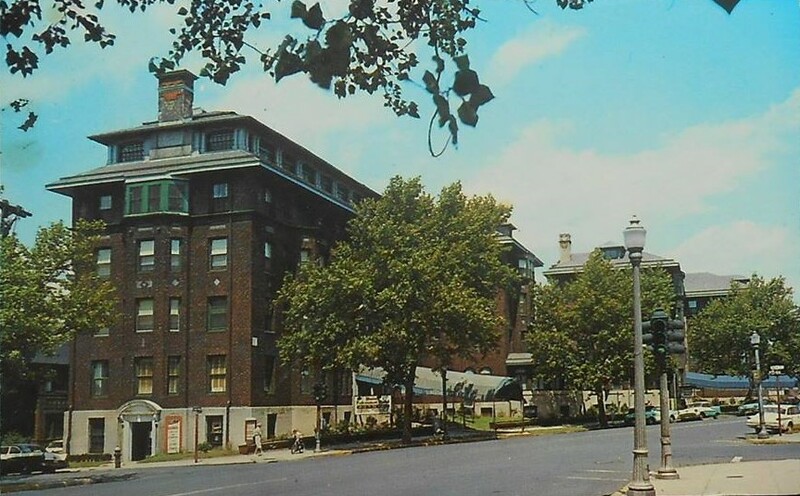 The color photo looks north along Albany Street (before it was widened), while the black and white photo looks west along George Street. The mosaic above is from four Trenton intersections, from left to right:. 1938: Crouse-Hinds Type T “portholes” ~ adjustables on the left corner and fixed-face on the right. There are lots of other spectacular treats, including street lamps, fire alarm boxes, business signs and murals and guide and route signs. 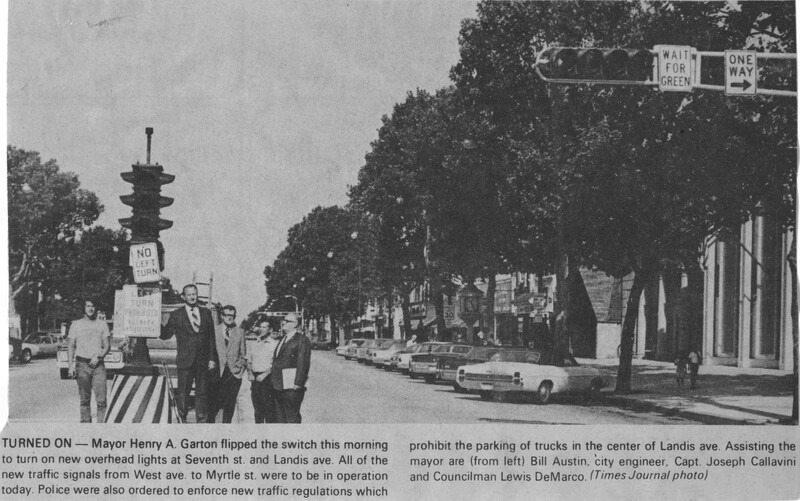 A newspaper clipping from 1972 shows the changing of the guard in Vineland. A very old island pedestal Crouse-Hinds makes way for a “modern” set of 12″-lens Crouse-Hinds “Type R” signals on truss masts. Four-way signals on Union Metal poles in Jersey City, looking a little worn already in this photo from the ’50s or early ’60s… The signal in the foreground is a GE Novalux with angled doors. The old urban municipalities in Hudson County are known by signal fans as one of the best enclaves of old signals in service in the country. These photos of old 4-way pedestal signals were taken in 2017 by Kevin Mueller. The blank doors with the “X” on the 3-way Marbelites are not like any I’ve seen elsewhere. The battered AGA 4-way may be the only full 3-color AGA signal left besides another one in Gassaway, WV. Collector David Prince eventually made his way to the same intersection with camera in hand, and although the paired light Chris had seen a couple years before was gone, a another Bakelite single head was still tucked away next to a telephone pole across the street, which he got great photos of(below), along with this video. Here’s a rare collecting score… Ohio collector Jay Jenkins has a number of really cool items in his possession, and this is one of my favorites. This pair of 1920s – ’30s solid-cast Horni signals with cast tunnel visors was once mounted atop a post. Yes, this came from New Jersey, and it is the only survivor like it that I know of. Signal heads from the pre-WWII era were still around in decent numbers when I was growing up, but they were nearly gone by the time I ever tried to photograph any of them. In 2003, I discovered this pair of 1920s/’30s Horni signals at the corner of Vauxhall Road and Glenn Avenue in Union. They are the same model as Jay’s signal above, except with cutaway visors. One head was wrapped in plastic due to the reversal of the one-way direction on Glenn Ave.
Incredibly, these survived for about another ten years after I took the photos. Heaven knows, I tried to get a hold of these signals through with Union Township and Union County, but to no avail. These were likely the last solid-cast Hornis left in New Jersey. Still there!! 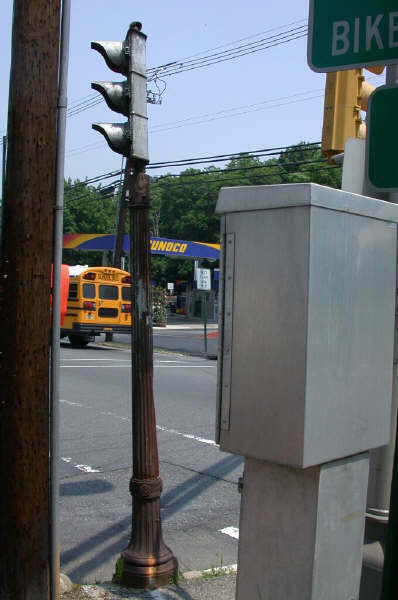 This photo is a Google screen grab of what is likely oldest signal in service in New Jersey. This is a 1920s “pedestrian island beacon” with amber lenses (now LEDs) all around, beautifully maintained by the city of Summit at the corner of Maple St and Union Pl. The manufacturer is American Gas Accumulator out of Elizabeth, NJ. Another AGA signal that survived for an exceptionally long time was this one on Franklin Turnpike in Mahwah, which I photographed way back in 2003 or so. I don’t have my original set of images of this, but I recall that it had Corning large bead “Type E” lenses. GE signals were very popular in Newark. In 2005, I spotted this solid-cast 1930s GE Novalux still going there. The lenses were the original GE Holophane “spider web” glass lenses. Sadly, his light was replaced soon after I found it. There are still many modular GE signals in Newark today, but I’m not sure if any solid-cast Novaluxes are left. Here is the Novalux that I had in my collection.